All the 36 books for which story boards are going to be produced have now been scanned. 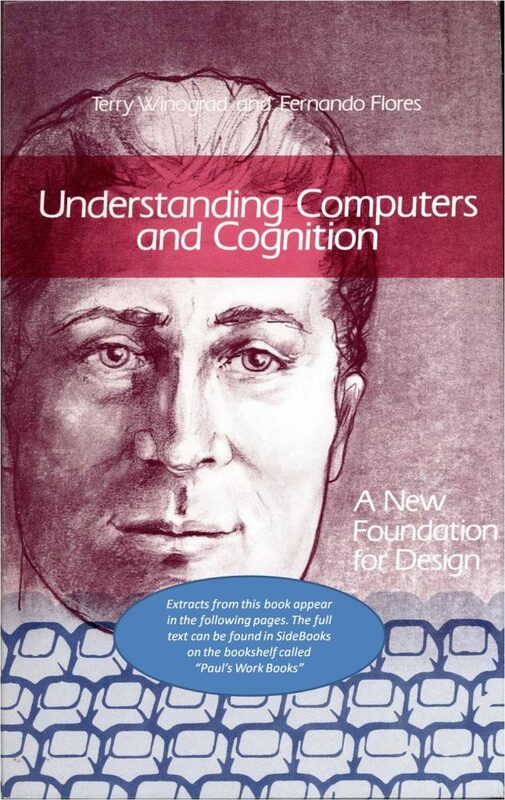 As I found in the previous Electronic Bookshelf Journey, the scanning process became easier and faster the more books I completed. 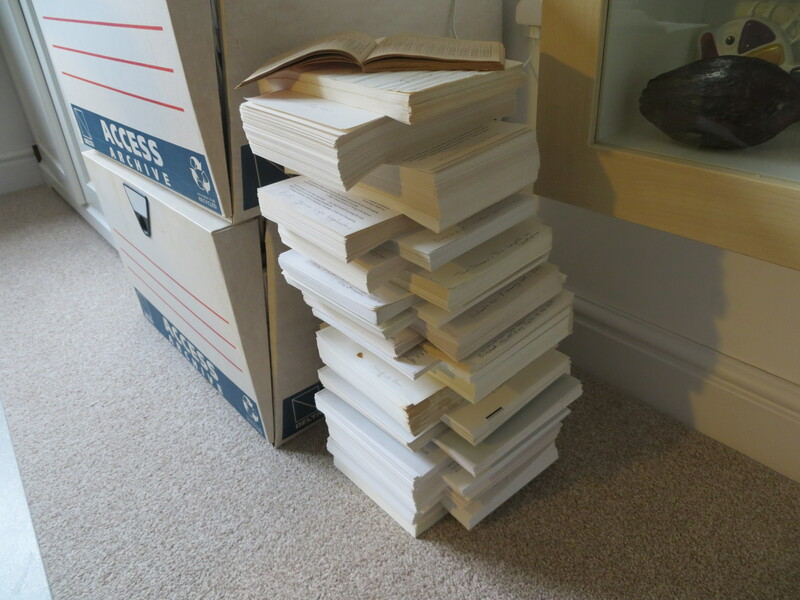 However, It is still a tedious process which takes a significant amount of time simply because of the volume of paper involved – the photo below shows the stack of cut pages that were dealt with – and there were a few other books which were scanned without being cut. At least this time round I discovered a quicker way of creating Contents bookmarks in the PDF editor. I’ve also finalised a standard structure and format for the Story Board pages themselves. They will be PDF documents with a front page like the one below (ready to be printed out for the physical Story Board display), and with all the linked pages following on behind i.e. 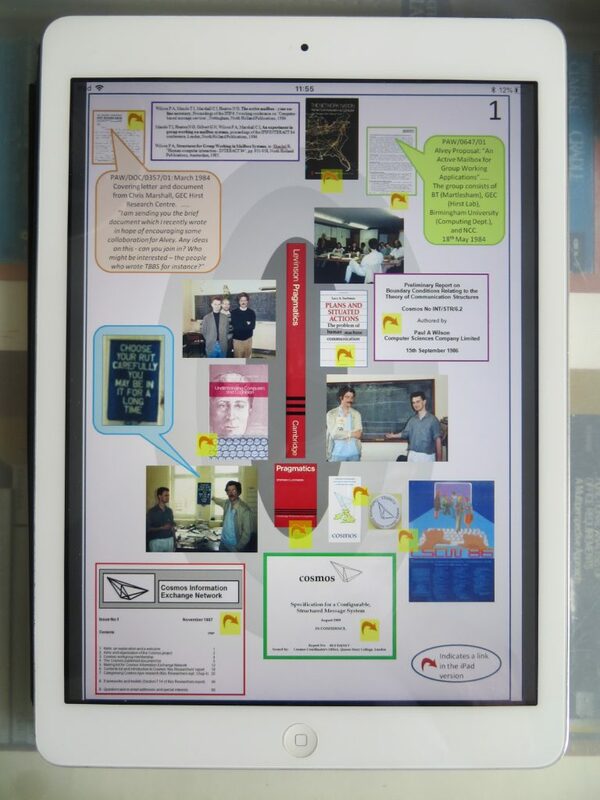 the PDF will be a completely self-contained PDF document so that it can be viewed and explored as a single electronic document within the SideBooks app on the iPad. I would have preferred to link out to other documents within SideBooks rather than packing everything into the one document, but that functionality doesn’t appear to be available (though I couldn’t be absolutely sure because the only documentation I could find for the Sidebooks app is in Japanese). After much experimenting I found that the best way to insert the links into the document was to a) to place the link arrows in a Powerpoint version of the front page, b) save the front page as a jpg document, c) insert the front page jpg into the PDF Story Board, d) overlay invisible link rectangles around the arrows and set their destinations to be the relevant page elsewhere in the document, e) send the completed PDF Story Board to SideBooks via DropBox, and f) Open the Story Board in SideBooks which displays the link rectangle areas filled in with an yellowey-type colour as shown below. 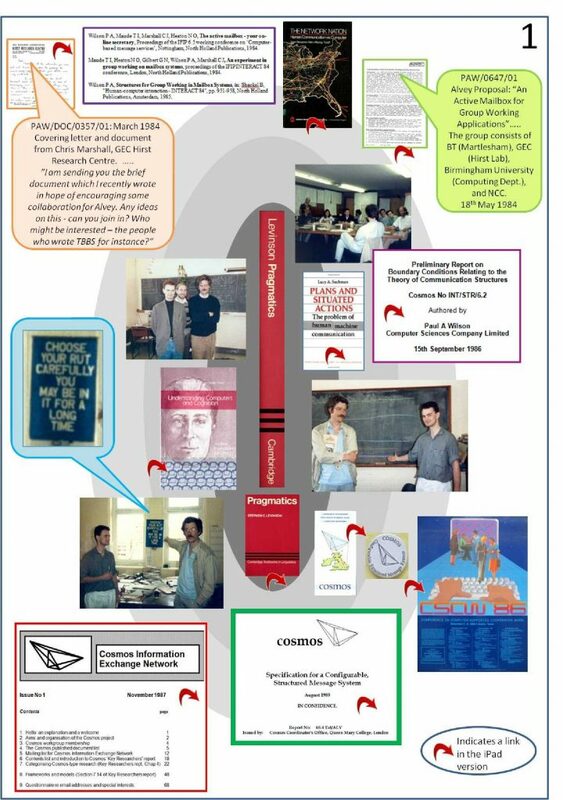 This first PDF Story Board (for the Levinson Pragmatics book) contains 299 pages even though only a subset of pages from some of the linked documents are included: it would hinder navigation and be generally impractical to include the full text of all the linked books and other large documents. Hence, I decided to include only the key pages from the longer items and to place a note on the front pages of the items concerned indicating where the full text can be found – as shown in the example below. With the basic scanning and design work completed, I can now get on and create each of the 35 remaining Story Boards.